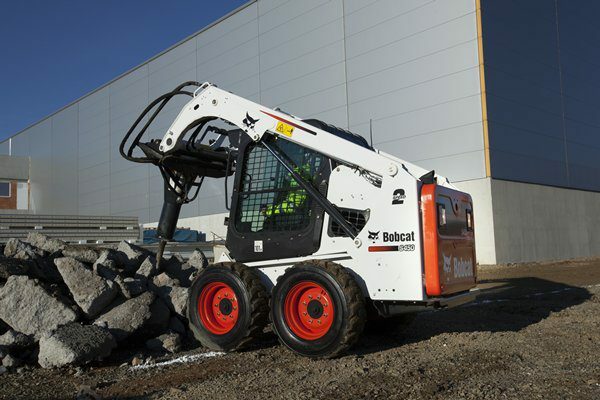 The Bobcat S450 combines all the advantages of a truly compact loader but incorporates many features found on larger machines. The S450 offers class leading comfort and visibility to allow for greater control and accuracy in tight working spaces. Additionally, and uniquely for a Skid Steer in this class size, a fully pressurised cab with air-conditioning option available. 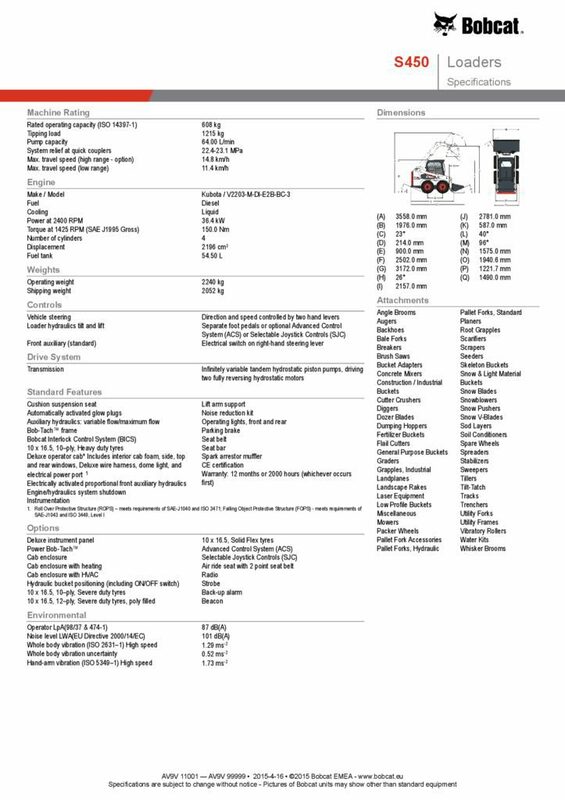 The comprehensive options list allows you to configure your machine with different operator controls and 2 speed functionality for added comfort and productivity. To complete the compact package, serviceability features and uptime protection are on a level also seen on larger models. 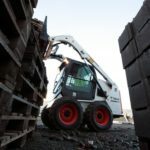 The S450 uses the same large range of attachments as used on our other models to bring you the most comfortable compact loader for any application. 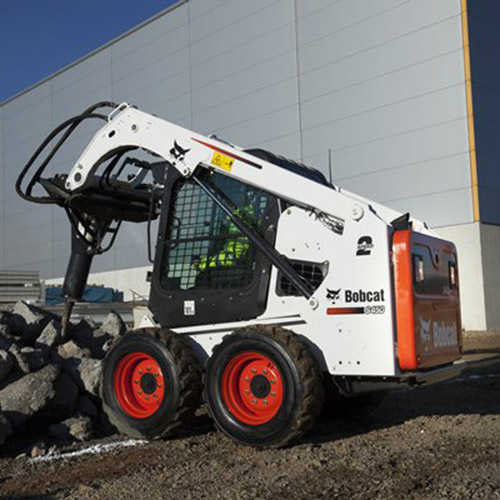 The Bobcat S450 combines all the advantages of a truly compact loader but incorporates many features found on larger machines. The S450 offers class leading comfort and visibility to allow for greater control and accuracy in tight working spaces. Additionally, and uniquely for a Skid Steer in this class size, a fully pressurised cab with air-conditioning option available. 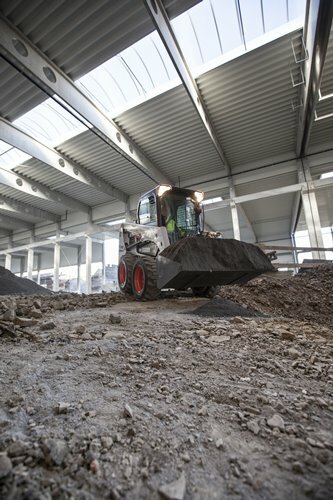 The cab comes straight from our larger loader range and has been cleverly designed to maintain a compact size but bring large machine operator control and comfort – the more comfortable an operator is, the more productive they will be. The cab interior area has been designed to provide more space around the operator. The cab side windows are on the outside of the cab also making them easy to clean. The threshold of the cab door is low and the size of the cab door opening makes it easier for operators to safely enter and exit the cab. 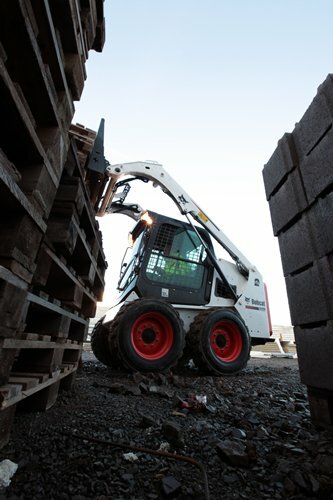 The cab has best-in-class cab pressurisation, and uniquely on this size of loader, an air-conditioning option. With a one piece seal that goes all the way around the door, pressurisation minimizes the dirt and dust that might enter the cab. The high performance heated cab option guarantees a warm environment for cold and wet working days and the controls are fully illuminated so the temperature settings can be chosen in low light conditions. 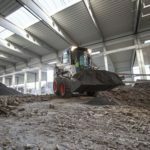 The forward positioning of the cab gives the operator clear visibility to the working area and attachment and this is further enhanced thanks to the large door opening and a low boom front cross-member. The low cab side windows, low boom pivot point and large rear window all add up to great all round visibility – a real plus on a compact machine of this size. In addition the front working lights use two bulbs with enhanced distribution reflectors to shed light to the entire working area. Rear working lights are a standard fitment. The tailgate is designed with a short vertical height with stiffening pocket to provide strength but a slim fit . This design allows the use of a tailgate protector integrated into the machines mainframe while keeping compact dimensions. Refuelling of the loader can be made in a transport position because the tailgate door opens on the same side as the protected fuel fill. Service of the drive train is kept to a minimum with drive belt tension managed by an automatic (torsion spring) tensioner and the drive chains not requiring any periodic adjustment. Flange protected axle seals and a fully welded chaincase and axle tube assembly complete the durable drivetrain. The oil cooler and radiator are a combination unit that provides a clean cooling environment less likely to trap debris than conventional layouts. This design also aids routine cleaning. The main hydraulic filter is a long life “in-tank” (cartridge type) filter with a replacement interval of 1000 hours. The hydraulic sight gauge is mounted under the rear screen and is easily visible during routine checks to help the operator quickly check hydraulic oil levels. Electrical protection is provided by dedicated fuses for individual circuits and mounted in an easily accessible box near the battery in the engine compartment. Battery access is very easy once the tailgate is swung open and the battery is protected from debris and heat with the use of a dedicated cover. The exhaust muffler is mounted directly to the engine, without a flex element to help reduce noise and vibration.